Description Following Dr Michael Mosley's Number 1 bestselling 8-week Blood Sugar Diet, this cookbook offers carefully-crafted, nutritious, low-calorie recipes to give you the tools you need to prevent and reverse type 2 diabetes. 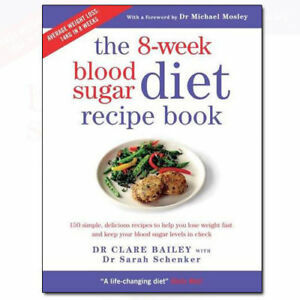 Author Biography Dr Clare Bailey is a GP who has developed the recipes in this book which she shares with her patients, many of whom are on the Blood Sugar approach. She is married with four children. Dr Sarah Schenker is a Registered Dietician and Nutritionist who has served on both professional and government committees. She developed the recipes in the original Blood Sugar Diet paperback, and The Fast Diet Recipe Book. Dr Michael Mosley is a British journalist, scientist, producer and TV presenter. The book is easy to read, nicely spaced out and "invites you in" There are some colour photos but not one for each recipe. I prefer the recipes in this book to the ones in the original BSD Diet book. Sometimes I have to adjust the cooking time or temperature to suit my oven but I haven't had any disasters yet. There's something to suit most tastes, though the addition of some vegetarian main meals other than salads would be good in a revised edition. But it's an excellent book and if you're trying to follow the BSD or low carb principles it will be a good addition to your bookshelf. The way forward for many..
Having tried the 8 - Week Blood Sugar Diet, and achieved a good weight loss, it was the next step to buy the recipe book, and continue the eating plan. Really informative, I certainly think it's the way forward for many people; not just those with T2 diabetes, or pre diabetics, but for those who would like to change their way of eating to a healthier and more sustainable option. I have used several of the recipes in this book which are easy to follow and work well. Good, common sense, information and recipes can easily be part of your daily diet. Also uses lots of store cupboard ingredients. I would recommend this book as a way of reducing sugar in your diet without really noticing. I got this with the 8 week blood sugar diet book so I'd have a range of low carb recipes without having to go looking too hard! They are easy to follow and I have enjoyed the meals.. without feeling hungry. I would recommend it to people looking to follow this plan as I found it didn't need lots of willpower to stick to it and it worked for me.